Essential Skin Solutions Inc. is a leading skin care company founded by Carell Zaborski, dedicated to the research and development of revolutionary skin care products. Working with internationally renowned medical professionals, and drawing on her 25 years of experience in the industry, Carell and her team created the innovative System for Optimal Skin™ (S0S™). Carell Zaborski is founder and president of Essential Skin Care Inc. Having spent years working as an esthetician, spa owner and skin care educator, surrounded by products that promised the earth but delivered very little, Carell set about launching her own system. 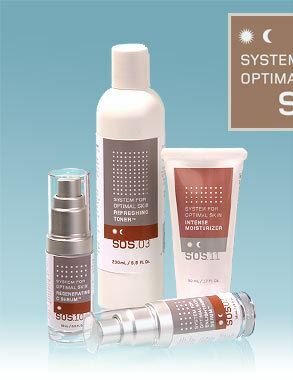 Ten years later, her energy and expertise have resulted in the revolutionary System for Optimal Skin™ (S0S™). Fascinated by skin care and the aging process from a young age, Carell remembers a time when women looked only to products to rid them of their laughter lines, and plastic surgery wasn't an everyday occurrence. The increasingly educated and sophisticated consumers of today are still demanding maximum-performance, non-prescription products that will slow the signs of aging and provide them with the skin they crave. Only when Carell was confident that she had achieved her personal vision with SOS™ was she happy to unveil it to consumers. The groundbreaking correction system takes skin care to the next level and is clinically proven to provide visible and dramatic results, without the side effects or sensitivity that are generally associated with high potency products. With an innate understanding of skin care, Carell is a trusted voice within the industry and educates consumers and professionals through her columns in leading spa publications. Her entrepreneurial spirit is a strong match for the ever-growing demand for new and improved skin care products, and will ensure that the SOS™ system remains at the forefront of the industry and consumers' minds.